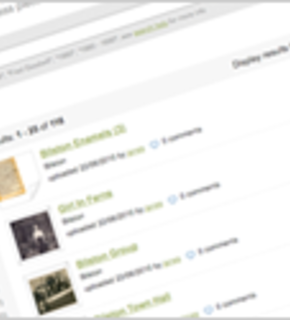 ShareHistory is a place where we can build up an archive of our history. There are no categories or limits to the type of history you can upload and search - family, local, military, political, company, rural, urban, national, international, stamps, medals, war, peace... All history is welcome here. The more we have available in quantity and diversity, the better our view of history will be. We want to bring as much information into the picture as possible so you can upload photos, documents and memories. And there is no limit to the number of items you can upload, store and share. History should be fun, sharing problems may help solve them, sharing common interests may create new friendships and you may find relatives you didn't know you had. Easy Searching Self tagging makes for easy searching. Just put what you want to search for into the search box. It could be a person's name, a place or an event. If you don't find anything make your search more general. We like to make the search facility as easy as possible for you!